Paul came with me and we hit the road as soon as the battery arrived by courier. Man, it was poisonously hot on the Hume, that concrete road surface reflects every bit of heat and even my normally excellent air-con struggled to keep up. However, we made good time and delivered the battery. I was stunned at how good the bike looked since I saw it last. 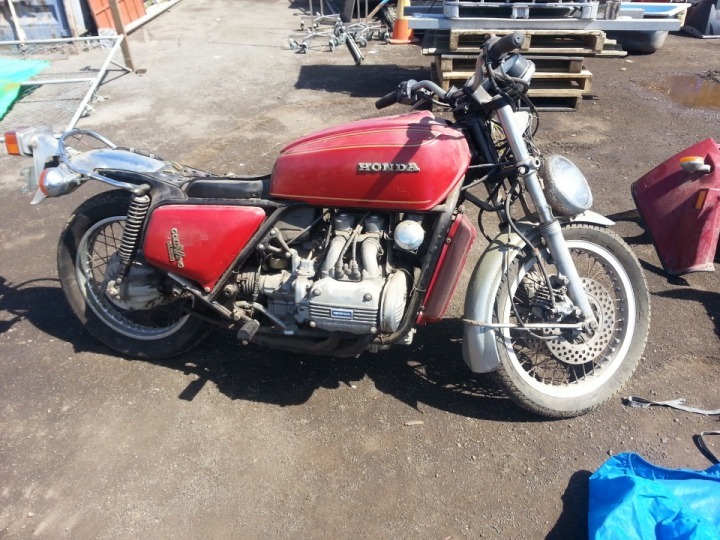 This is a 44 year old motorcycle and that is the original paint, just carefully buffed up. Explains a lot about why people talk about Honda’s legendary build quality. Grub filled up the battery and prepped it and installed it and it was time to start the motor properly. It sounds a bit “tappetty” but it will quieten down a bit with a run. 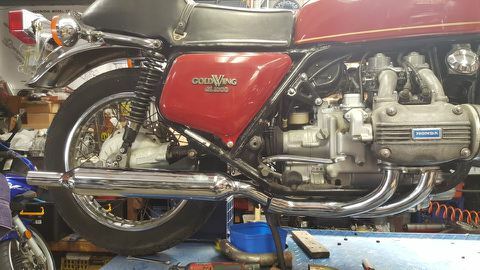 The Triumph mufflers not only look good but sound good as well as he ran it up in the driveway. Then it was time to hit the road. 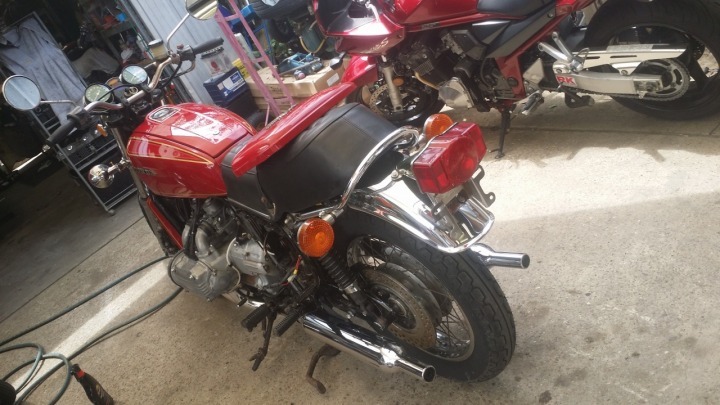 Now the bike isn’t registered yet (God knows when it was registered last) so there was no way I was going to ride it, but Greg just couldn’t wait and he lives in a very quiet street in a very quiet suburb. 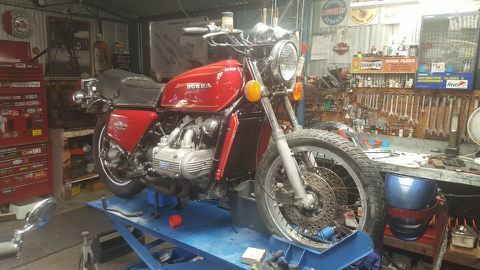 And, anyway, who am I to deprive him of the enjoyment when he has spent the last two years getting the bike to this stage? I must say that he looked pretty good in the saddle and he has no problems getting his feet down and he’s shorter than me so that was a plus as well. What a thrill it was to see the bike moving under its own power. A couple of laps around the block, sir? Oh, why not? But discretion is the better part so, having found out what he needed to, Greg returned to base. The clutch is amazingly light but the brakes, with brand new everything, felt very “wooden” according to the road tester. A good run and a few hard applications will soon sort that out. All that is needed now is a matching period-proper back wheel and new spokes (Greg will take care on both of these) and a rechroming job on the front forks (I’ll organise that when I get it home). The tyres are almost new but are goodness-knows how old so they will be replaced with new, NEW ones and we should be right to front up for a set of Historic plates. The original brief was that I wanted a bike that looked OK, was period correct and ran well. 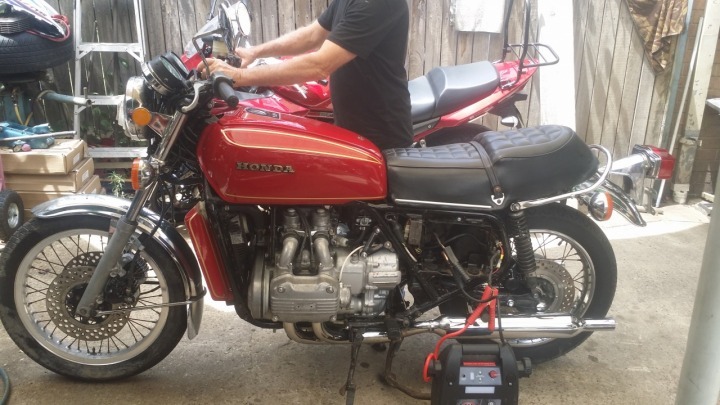 There was never any thought of a concours restoration, the bike is to be ridden not showed. True to his word and, to his OWN amazement, Greg has exactly fulfilled the brief. As with the Shadowfax, some will criticise it as a “chequebook restoration” but I don’t care. I have always wanted a 75 ‘Wing and now I have one. I can’t thank Greg enough for the multitudes of hours he has spent on this job, he has been meticulous above and beyond the call of duty. Oh, and just in case you’d forgotten, this is what my sad little thing looked like the first time I saw it. Am I a happy chappy? Hell, yes, I am.